It’s safe to say that no one likes to lose. The weight of defeat can seem crushing, but we do all have the option to use it as an opportunity for growth and learning. As difficult as it may seem to look at losing with any other mindset aside from anger and disappointment, there are actually two different ways to handle it. We Sarasota Sun Devils want our players to know that every game serves as a way to better ourselves, no matter the outcome. This requires a specific mindset. Written on November 30, 2018 . Cheerleading Will Help Your Child Achieve More Goals! Cheerleading is an outstanding sport, which teaches children about teamwork, responsibility, and their bodies. In addition to cheerleading being an excellent way for children to get exercise and experience working as a team, cheerleading also helps your child achieve other goals! Written on October 30, 2018 . Ideas for Sarasota Fall Family Fun! Written on October 16, 2018 . Fall is the perfect time of the year to plan some family fun. There are plenty of season-specific activities that are great for families to do together. Learn about eight ideas for fall family fun by reading on. It’s OK to feel passionate about your child’s participation in sports. Taking your child to practice and going to games is an incredible way to show your support, but sometimes it’s possible to get too involved. If you find yourself wanting to complain to the coach of your child’s sports team, here is what you should remember. Written on September 20, 2018 . Working together as a team builds communication skills, bonds, and relationships. Teamwork is also a valuable skill for children to develop as they grow. Another valuable skill to learn is paying it forward. If your child is involved in a team sport, learn how your child can pay it forward throughout the year as a team. That time of year again! 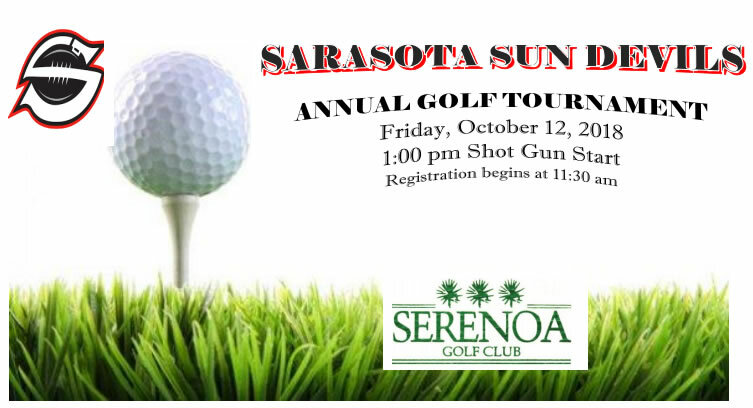 Sarasota Sun Devils annual golf tournament fundraiser will be held on Friday October 12, 2018 at 1:00pm at the Serenoa Golf Club. Registration begins at 11:30am. Written on August 31, 2018 . Fall is back to school season, but it is also football season. If you have a child who is in school and also participating in football, it can be difficult to find a healthy balance between the two activities. For help learning how to make homework a priority during football season, continue reading. Fall Football is Coming. Check out These Camp Prep Tips! Written on August 15, 2018 . Football season is approaching quickly, which means it’s time to prep for fall football camp. If your child is getting ready for football camp, consider sharing the following advice with them so they can get the most out of their experience.